Advanced Popup extension for improving conversion. 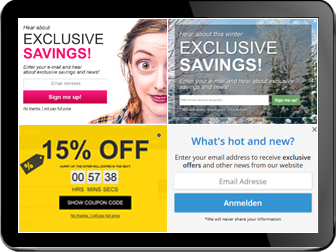 Different styles and templates, newsletter, exit intent, A B testing and more. An advanced, fully-customizable Magento 2 popup extension. Easy to use, no Coding Required and Mobile Responsive support. 40+ popup themses you can choose or create your own popup. Buy Now Urgency. Display countdown timer with dynamic coupon code. Display a popup if your user tries to leave your site with a product in cart. You can display a time limited dynamic coupon code to keep your visitor on your site. Display popup when cart subtotal is between $90 and $100. Offer free shipping if user spends $50 more. Show additional products customers may be interested in purchasing based on specific attributes. Display different offers to users that came from specific websites or countries. You can display different popups for Google, Facebook, or other visitors. Display additional products customers may be interested in purchasing based on cart content. TECHNICALLY BETTER:500% less memory consumed. You don't want extra 10Mb of memory consumed per ajax call, right? Details. FANTASTIC SUPPORT:Professional and super responsive support. Avererage response time is 0,5h. FREE BUGFIX:We guarantee a free bug fix for whole 4 months! REFUND GUARANTEE:30 days money guarantee. WORKS ALWAYS:It works on all Magento 2 versions. No conflicts with other modules. No conflicts, works with any cache module. Based on best rated Magento Popup extension! Our Magento 2 Popup extension code is based on our Magento 1 extension which is best rated Magento Popup extension on market. 60+ positive reviews inside Magento Marketplace and 2000+ installations. No other Magento popup extension has so many options to show popup based on user behavior. No other Popup extension can show popup based on user behavior with so many conditions options and without cache issues or without spending too much resources. Our solution uses ajax call for popup loading to prevent cache issues. Loading Magento models for each ajax call would spend too much server resources. For this reason we developed custom php library that is used to load popups which spends up to 500% less server resources. This is extremely important, you don't want to spend almost twice as much server resources. See the list of functionality and our reviews inside our Magento 1 Popup Extension - one of the best reviewed Magento extensions inside Magento Connect market. Both products have almost the same functionality (except Register, Countdown timer, Contact form and Social like widgets which are not included in Magento 2 version yet). -Observer bugfix: di:compile showed warning because of "use Magento\Framework\DataObject as Object;" line -_afterSave bugfix for mass action (): When user used mass action inside popup grid to change popups status, it removed store, category and some other selections from the selected popups. This bug has been fixed with this release. -Empty popups in grid bugifx: In some rare cases new records of empty popups appeared inside popup grid. Copyright © 2016 Magebird.com. All rights reserved..